1. 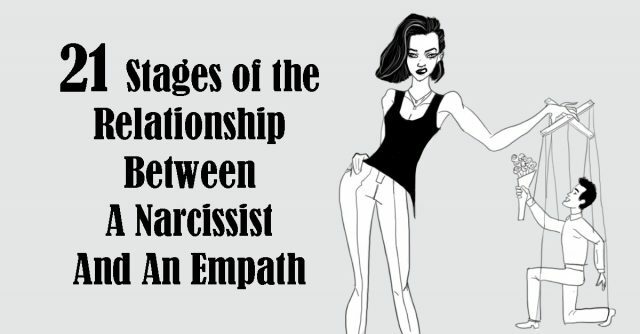 The narcissist attracts the empath. They begin a relationship. The empath’s love is deep and unconditional. The narcissist, on the other hand, has no intention of developing a stronger connection and getting close to the empath. The empath is happy and satisfied every time they are around the narcissist and they falsely think that their love is being reciprocated. 2. The empath starts to feel like they have finally met the love of their life. The narcissist asserts them by designing an illusion which leads the empath to think that they have a special bond that is impossible to break. 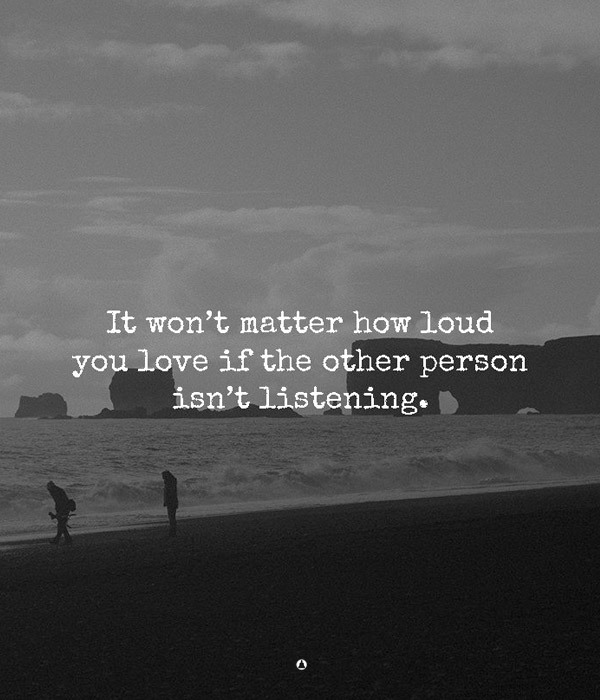 At times, it may look like the narcissist wants the relationship as much as the empath, but this is not true. The narcissist only wants to be in control. 3. As the time passes, the narcissist will try to break the empath’s self-esteem by making them feel weak and unable to do even the simplest things. The narcissist will never openly attack the empath, but they will say something like, “I don’t mean to hurt you but…” and then mention some “shortcoming” of the empath. The whole control of the relationship will be in the hands of the narcissist as they will start making every decision. The empath will gradually start to believe that they are incapable of anything and that they are lucky to have the narcissist in their life. 4. The narcissist will become the sole center of the empath’s universe as they are the ones that are truly in love. They will always try to help, take care of, cheer up and soothe the narcissist. They will always be there for the narcissist whenever the narcissist needs them. The narcissist will try to present themselves as the victim thus manipulating the empath into giving them what they want since the empaths are natural givers. 5. The empath’s intentions are pure. The empath has a good heart and they cannot understand the fact that the narcissist’s wounds are different from theirs, and so is the healing. The narcissist’s wounds cannot be healed with love, as the empath believes because the narcissist is a person who is immune to love. 6. The relationship starts to be all about the narcissist. 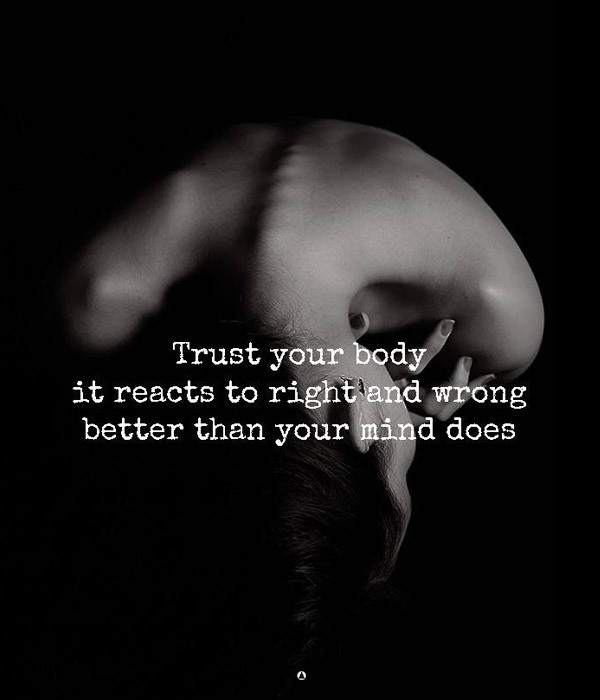 Eventually, the empath will realize this, because as the time passes, they will start to feel afraid to state or fight for their desires and needs in the relationship. The empath will rather die than give someone a reason to dislike them, so they will still try to please the narcissist even though they are not happy in the relationship. 7. The more affection, devotion, effort, love, and care that the empath gives to the narcissist, the more in control the narcissist feels. And as long as the empath continues to put in the effort into the relationship, it is almost impossible for them to see a problem in the relationship. The problems arise when the empath finally ‘wakes up’ and reaches their breaking point. 8. The empath will eventually raise their voice because they can no longer stand the devaluing ways of the narcissist. The empath starts to feel devastated because their emotional needs are not being met. When the empath realizes that they have been living in a delusion all the time, they will start to speak up their truth. The narcissist is not happy with this new turn of events. 9. The narcissist is someone who needs constant attention. They feel satisfied when people obsess with them. However, they can never be happy no matter how much attention and praise they get from others. They always need more. And the empath often fails to understand this. 10. When the empath finally decides to honestly talk about their feelings with the narcissist, the narcissist is quick to call them “crazy”, “delusional”, or “over-dramatic.” They would dismiss any of the empath’s efforts to save the relationship and they will try to manipulate them again to regain the control. 11. For an empath, this behavior is impossible to understand. They would start blaming themselves for everything that is wrong in the relationship because the narcissist has them feeling like they are not good enough and they are not worthy of love. 12. The empath fails to understand that they are being manipulated once again. The narcissist has created a twisted way of reality in their minds. The empath is being gaslighted to a point where they cannot believe their own perception and sanity. They couldn’t see the truth that the narcissist is the one who is wrong and wicked, not they. 13. Every empath’s attempt to communicate honestly with the narcissist is pointless. The narcissist will always try to pass the blame to justify themselves. 14. The empath should know that it is completely okay and normal to feel confused, lost, defenseless, and deeply hurt. They need to do a lot of self-reflection and work on themselves to start feeling okay again. 15. Empaths are the healers of society. They have the inner strength that is necessary for them to overcome any challenge that comes their way. They can alleviate the other people’s pain as well as their own only if they are willing to do that. 16. The empath will eventually realize the bitter truth that the narcissist does not deserve their affection, love, and care. They must understand that not everyone who puts a sad face on is showing their true colors. There are many people out there who have vile motives and use many manipulative techniques to get what they want. The empath must face the brutal truth that not everyone who says ‘I love you’ really means it. 17. In the above situation, the empath needs to understand that they are the actual victim in the relationship – not the narcissist. 18. When the empath realizes that the narcissist will never change – this would be a painful revelation and awakening for them. However, this is essential for the empath to move forward and put an end to the toxic relationship with the narcissist. 19. The narcissist will go on with their life as if nothing has happened. They won’t even remember the enormous love and appreciation that the empath has given them. 20. The narcissist will move on and find a new victim. 21. The empath will become wiser, stronger, and more cautious of to whom they give their love, time, and affection. I see this everyday unfortunately. You forget the part where the narcissist will try to punish the empath foe leaving and do his worst manipulating the empath into not leaving the circle of influence. Accurate summary, in my case, spread over 15 years. I still cannot come to terms with the Narc never having to face the consequences of their behaviour. They get away with lying, cheating, stealing, freeloading, abuse of all types and ruining people’s lives. We have to rebuild our lives after they ruin it and they are off doing the same thing to the next supply. It never stops leaving a trail of destruction! I want to end this constant need to know that they will pay. Being told that they are empty and void of emotions and scared people will find out about them doesn’t ease my pain. It doesn’t mean they pay for their wrongdoings. I am glad it’s over. But the lessons I have learned are priceless. This is now a chapter of my life. I have accepted things I cannot change and I have the wisdom to know the difference. It is just so difficult to comprehend how someone, anyone can be so cruel. So calculating. The depth of the hatred and disdain he had for women, myself included was frightening. I could feel it within him. It was unlike anything I’d ever experienced. I hope to goodness I never encounter another human like that. I thought my mother was the worst, but he had her by leaps and bounds. I’m sure this is how we met, and why I just felt so karmically connected to him. it was like I had known this man from a previous life. I was so drawn to him, I am still trying to get away. I’m going it, I just know the aftermath isn’t probably all done yet. I have been physically ill. it’s the craziest thing for me like this, so far. I hope never again. I sort of see this in my life ….but only just recently and this wasn’t coming from my partner. …this was coming from her son of 13 yrs and is now 16 yrs and is well in control to the point I’ve been kicked out allowed back in my partners life on his say so but at arms length to the point of just losing my mother 4 months ago I’ve not been allowed to grieve as my partner was ill her son was going through exams and stressed out my partners mother had just been diagnosed with a small skin tumour. …..so I put my partner first as there were issues with my mother’s death that had to be investigated. …once we buried my mother 8 weeks later and all other parties and their problems had thankfully being solved and all is well , did the real problems start for me ….I was humiliated for my moods my sadness my loss …I was being negative bringing the tone down I was weird they were all having little pow wow meetings behind my back. …probably in the lines of he’s no good he’s got a dead end job you can do better ect ….my partner has now a full time job and lovely house and furniture nicely decorated and who helped in all the this ???? yet I’m being told I don’t need you or your money. ….my birthday was a few weeks ago I got 5 bars of cheap chocolate I paid for us to go out it was worst nightmare in 6 and half yrs of being together. …the next day her son couldn’t wait to tell me he knew his mother didn’t want to go out in the first place !!!! I was promised when she got paid she would treat me to a meal after words ….I became I’ll the week later I may now have testicular cancer and was told to go to my room in a shared house. ..then she got paid went for a meal with her friend that hasn’t been on the scene for 4 yrs or her illness a nice little 4 some both their son’s. week after that I asked should we go out ….yes but when you feel it was a reluctant yes …I pushed the question the reply was absolutely stomach wrenching ” no I don’t want to I have no money ….I don’t want you to think I’m with you for your money! !! she then went out again with her son and mother 2 days before my late mother’s birthday on 10 November that she had promised to come and help with the grave ….not a word was mentioned. ..I went on my own early got a message of so where are you now !!!! I reminded her ….oh sorry I didn’t know? ??? Should they be all shot or drowned at birth, im an empath im married to a narc and my dad is the king of narcs, there is no hope your saying, I cannot wash my hands of them. This is exactly what happend in my relationship… This person used and abused me emotionally. And the sad truth is I only realized this after a year of a dedicated, loyal and honest love. I wasted everything and will never be able to get this past year back. And this Narcissist will never even be upset or take responsibility for their actions, only look for the next victim. To C, I am right there with you. It makes me ache to know their life will go on and they Will be perfectly fine without me. Year and a half of complete and true love. Only ending because I realized the truth, he is still trying to manipulate me now even when after I left him saying he will take me back but I need to change and fix things, when I never did anything wrong! Glad I realized before I wasted another year of my precious life. While reading this, I felt as if it was written for me. I now know I need to get away and fast. I can relate so much. I felt I wasted my feelings and time for someone who only cared about getting their needs met. They use their words wisely to make you feel wanted but they only look for their benefit. They feel miserable and want you to join the club. Now that all ended I can see what a sad life they do have ahead of them. They will not be able to bond with people or have long-term relationships because they do not care deeply enough about anyone. You are only a temporary plaster to cover their wounds. Everyone will realise their games at some point and leave them, and rejection is one of the things they want to avoid at all costs as, deep down, they feel inadequate and need your validation. And I feel sorry for the ones who will become the new victims because that is the only way a narcissist operates. They will always be looking for new supplies of attention and admiration…people willing to feed their bruised egos. They are the most insecure people you’ll meet in life even if you could admire some of their qualities or the things they are able to achieve on the surface. Below all that, there is a person who has decided to not confront their unresolved issues but rather blame others for their miserable choices. When confronted, they might even show pride in how they have behaved even if it is clear that they have used you or treated you badly. Preserving their fragile ego is their highest priority. Thankful for the lessons learned, it was a painful process but you come out of it empowered. I will never allow someone to treat me like that again. This helped me so much. It is helping me to heal. I was in a relationship with a narcissist girl (learned about narcissist after reading this article and some other research). She broke it twice within 5 months. Her reasons were not so convincing and she didn’t got anyone else too. I loved her unconditionally. I did my best, i gave my 100%. Yet, she left me again. She had left her last 2 boyfriends, she told me her story, i believed her as she always told me the truth, but it is the truth too that she covered her mistakes and put blame on others. I didn’t knew that she covered her mistakes, i didn’t had anything to cross check, i thought she is a good girl (there were some basis which seems completely fake now) and it’s not bad to try rather than not to try. I got attached. I’d cried. I didn’t get good sleep for days. While reading the article, i felt its about me. I’m glad that I’m no more into it, its very much painful to lose someone whom you truly loved (this time she put blame to her own parents), but it’s better to not stay in a relationship with a narcisstic girl, i don’t need her anymore.